“Coworking Space” refers to the Premises that is made available by Us or any our approved Affiliate/s for the use of activities as permitted by Us. “Services” means and includes provision of Premises and integrated systems of communication and assistance including the use of the website. “Data” refers to all that information, documents etc., provided by You. This data may be provided to us through various means including personally, on our websites, telephone, e-mail, registration forms, polls, or such other similar channels. When You use Our services, You will be subject to all Our terms, guidelines and policies. As long as you comply with such terms, policies and guidelines, We grant You a personal, non-exclusive, non-transferable, limited privilege to enter and use our website, space and services provided thereof. Innov8 owns and operates the services provided through this Website. We reserve the right to modify, amend or vary any of these terms and conditions as well as the policies and guidelines as may be necessary. We may change/modify the terms and conditions of use from time to time, at our discretion, with or without prior intimation to You and such modification shall be effective upon its posting on our website. You agree to be bound by any modification when You continue to the space, premises, co-working, website and/or our services, or any part thereof, even after any such modification is posted on our website. It is therefore important that You review these Terms regularly. You are not eligible and may not use our space, premises, co-working, website and/or services, or any part thereof, if You are not eligible to enter into an Agreement as per the applicable laws in India. If You are a minor, We will require parental consent in writing before considering permitting you to be a part of our Community or in any manner associating with You. Whether You are an already existing User using our Premises and/or Services or a User intending to use our space, premises, co-working, website, and/or Services, or any part thereof, and if You are an individual or organisation (including a company, LLP, partnership etc.) and any other entity. This includes Your agents, authorised representatives, affiliates, associates and people operating through or under You or Your reference. 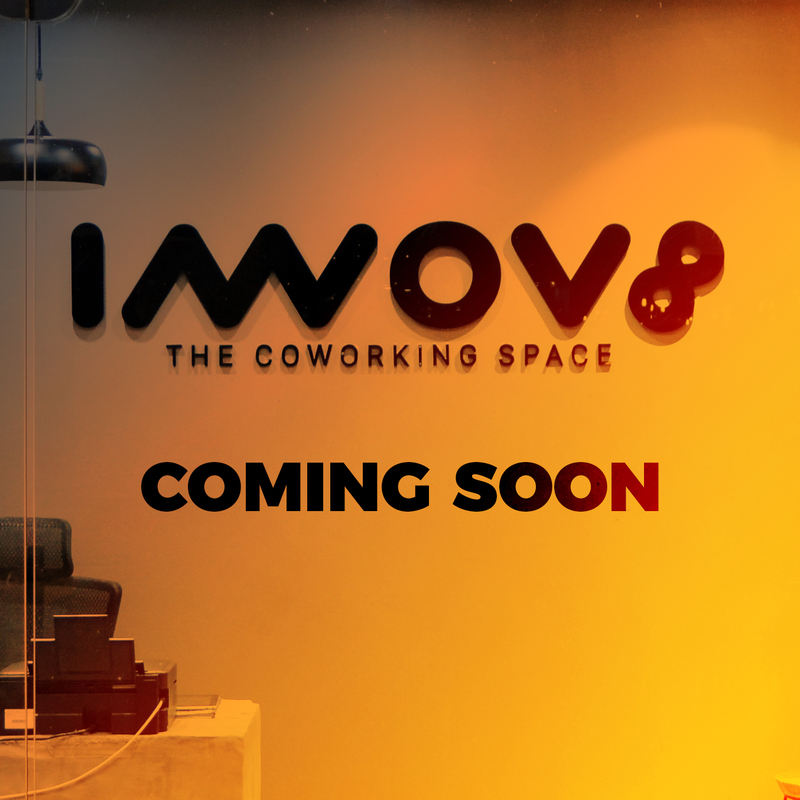 We, at Innov8 believe that it is imperative for a successful venture to have optimum utilisation of resources, and We endeavour to make it simple for You to take advantage of the space, premises, coworking and related opportunities and/or services. Innov8 reserves the right to accept or reject your application, without according any reason/s for the same. Please note that our acceptance or rejection will be communicated to You by e-mail. Once You are a registered member, You are entitled to use our website, space, premises, coworking, and/or all services provided therein, or any part thereof, subject to payment of a remuneration. You may, at any point of time, cancel your membership with Us. This may only be done through a written communication addressed to Us with at least 30 days prior to the ‘due date’ for payment of the membership fee for the following month, unless agreed otherwise. Unless, You communicate your intention to terminate/ cancel the membership, your membership will be automatically renewed. Your failure to make payment on time, may result in an automatic lapse of Your membership. Your failure to make payment shall make You liable for any reasonable costs incurred by Us in recovering the same including legal expenses charges etc. We reserve Our right to terminate Your membership without any prior intimation, if You violate any of the terms and conditions or policies or guidelines, or for any other reason as it deems fit. In consideration of Your use of Our space, premises, coworking, website and services, and/or any part thereof, You represent that You are of legal age to form a binding contract and are not a person barred from receiving services under any law in force in India or other applicable jurisdiction. If You provide any information that is untrue, inaccurate, not current or incomplete, or we have reasonable grounds to suspect that such information is untrue, inaccurate, not current or incomplete, We reserve the right to suspend or terminate Your account and refuse any and all current or future use of our Platforms (or any portion thereof) at any time. You may access our website as available for Your information and use. Any information and/or content that is provided to You on our website may not be downloaded, copied, reproduced, distributed, transmitted, broadcast, displayed, sold, licensed, or otherwise exploited for any other purposes whatsoever without the Our prior written consent. We reserve all rights not expressly granted in and to the Website and the Content. You will be required to enter a valid phone number and electronic mail account while registering on Our website. By registering the same with Us, You consent to be contacted by Us via phone calls, SMS notifications or instant messages, e-mails or such other similar method, as the case maybe, in case of any subscription/service updates. If at any time You wish not to receive any future communications or You wish to have Your name deleted from our mailing lists, please contact us as indicated below. The Member agrees that this Membership Agreement does not constitute a lease or sublease but is only a license to use the Work Space and the Member shall not make any claim of tenancy in respect of the Work Space and acknowledges that its membership is non-transferrable in nature. The Member shall not have right of possession or occupation of the premises and shall only have a limited right to use the premises for his/her business purpose on a daily basis within the time limits as mentioned and subject to payment of membership fees. If You register with Us, You may be required to complete a verification process as part of setting up Your account and become becoming a part of Our community. Once setup, You are responsible for maintaining the confidentiality of Your account information, and are fully responsible for all activities that occur through Your account. Should there be instances of any unauthorized use of Your account or any other breach of security, please notify Us to stop processing requests from Your account, until further instructions. We do not make any representations as to the security of Our network or internet connections. You must adopt the security measures (e.g. encryption) You believe to be appropriate to Your circumstances. From time to time, there may be portions of the website, or other acitivities, outside of the internet, that may enable You to send emails and other types of messages/information to Us or to third parties and to participate in bulletin boards and discussion groups. All such emails, messages, information, postings to bulletin boards and discussion groups, activities, etc., become Our property once You submit them. Whenever You choose to initiate these kinds of communication with Us, or anyone else, You may be contacted in return. Also, remember that Our bulletin boards and discussion groups may be open to the public, and, therefore, Your postings can be seen by anyone and are not protected by Us. Please use Your discretion when deciding whether and what to post and whom to contact. We reserve the right, in Our sole discretion, to monitor, edit or delete postings from Our bulletin boards and discussion groups. This reservation of rights shall not under any circumstances obligate Us to conduct such edits or deletions, nor shall it cause Us to be liable for any such edits or deletions. Our Services depend on the information You provide. You are solely responsible for the Information You provide to Us. We reserve the right to collect user data including name, contact information and other details to facilitate the use of the space, premises, co working, website or other service/s. All information collected from You are on a bonafide basis. Misuse and misrepresentation of identity or contact details will lead to automatic termination of all services and benefits extended to You, without the obligation of a prior notice to You. We may disclose to third parties certain data related to You, without providing Your personal details such as name, residential and e-mail address, mobile number, unless: (1) You expressly permit Us to do so, or any other person You may specifically designate to disclose such information or (2) We are required to disclose such information by any applicable law or legal process. We reserve the right to refuse to perform any tasks and refuse such a request by You. We also reserve the liberty to report any such request, if we deem it necessary. You agree and accept that the use of the space, premises, coworking, website and/or services provided by Us, as the case maybe, is at Your sole risk and further acknowledge that Innov8 disclaims all representations and warranties of any kind, whether express or implied. You shall ensure that You will not indulge in any activities like asking any person who is using the space, premises, coworking, website or any of the services, or providing any of the above services including the service provider to break any Police/ statutory/ and/or government rules or do such things which are immoral or unlawful in nature, for any purpose. You hereby agree, accept and acknowledge that You will keep confidential and will not disclose in any manner, to any body the confidential information that You may be privy to, or be exposed to during Your use of the website, Premises and services. The Member shall take adequate safeguards to protect its employees, contractors, visitors etc. and its articles, possessions and properties and shall not hold Innov8, its employees, directors, agents liable for the loss, theft, or damage to such belongings of the Member. The Member needs to register on Innov8’s app and furnish the KYC details before the grant of Work Space to grant access to the facilities as per the Membership Agreement. In case of mobile team members, group coordinator or authorized person will need to take the ownership & furnish the KYC details. The Member shall fully comply with all applicable laws in relation to its business and that of the building premises. The Member acknowledges that its use of Work Space may on occasion be disrupted due to any ongoing maintenance work and the Company shall, to best of its knowledge, inform the Member in advance of any such known changes or disruptions to member access to Workspace or Services. Member shall use the Work Space for the business/commercial purpose of the Company and for its allied business activities and Supporting Office. Beyond operational hours, the Member will have access to its Work Space and essentials services like tea/coffee vending machine, washrooms, power backup etc. without troubleshooting. Visitors & guests are not allowed beyond center timings. List of national/ public holidays is available with community in-charge. For the sake of convenience, “Confidential Information” shall mean and include all information, in whole or in part, that maybe disclosed by Us, Our employee/s, agent, authorised representative, community member, co-worker, or a third party that is proprietary, confidential or private in nature. This information also includes, without limitation, information about business, sales, operations, know-how, trade secrets, technology, products, employees, customers, marketing plans, financial information, services, business affairs, any knowledge gained through examination or observation of or access to the facilities, computer systems and/or books and records, any analyses, compilations, studies or other documents or otherwise derived in any manner from the Confidential Information and any information that You are obligated to keep confidential or know or have reason to know should be treated as confidential. We may introduce You to independent third parties to complete Your tasks where we refer independent third party service providers, You shall be liable to pay the costs or services and fees as applicable to such third party service provider. Innov8 disclaims all responsibility and liability as regards the services, conduct or actions of such third party. Innov8 is the sole owner of the Website and all software created to provide You with the Services and any associated documentation and text. You may not, unless permitted by these Terms and Conditions, use the Website, or the material contained on it or linked to it (“the Material”), for any purpose. Such permission is specifically personal, non-transferable, and non-exclusive. We authorize You to view and access the content available on or from the website solely for your personal use. The contents of the website and of all other websites under Our control, whether partial or otherwise such as text, graphics, images, logos, button icons, software and other contents as well as compilation of contents (meaning the collection, arrangement and assembly), are Our property and are protected under law. Unauthorized use of such content will be violation of copyright, trademark and other intellectual property rights of Innov8. You cannot sell or modify the said content or reproduce, display, publicly perform, distribute, or otherwise use such Content in any way for any public or commercial purpose. The use of our content on any other web-site or in a networked computer environment for any purpose is prohibited. You shall not copy or adapt our code that is created to generate any content or the pages making up any of its website which is also protected by our Intellectual property. Innov8 owns the intellectual property in all the data/information/content that is collected by it or its affiliates or authorised representatives, agents, licensees etc. Systematic retrieval of Our content to create or compile, directly or indirectly, a collection, compilation, database or directory (whether through robots, spiders, automatic devices or manual processes) without written permission is prohibited. In addition, use of the Content for any purpose not expressly permitted by Innov8 in these Terms is prohibited and may invite legal action. All icons and logos that are the work/creation/conceptualisation of Innov8 , its affiliate/s or employee/s are the trademarks of and proprietary to Innov8 . The unauthorized copying, modification, use or publication of these marks is strictly prohibited. All materials provided on our website and otherwise, including, without limitation, names, logos, trademarks, images, kits, print-outs, text, columns, graphics, videos, photographs, illustrations, artwork, software and other elements (collectively, “Material”) are protected by copyrights, trademarks and/or other intellectual property rights owned and controlled by Innov8 . You acknowledge and agree that all such content is made available for limited, non-commercial, personal use only. Except as specifically provided herein or, no Material may be copied, reproduced, republished, sold, downloaded, posted, transmitted, or distributed in any way, or otherwise used for any purpose, by any person or entity, without Our prior express written permission. You may not add, delete, distort, or otherwise modify the Material. Any unauthorized attempt to modify any Material, to defeat or circumvent any security features, or to utilize our Platforms or any part of the Material for any purpose other than its intended purposes is strictly prohibited. These Terms and conditions of use, shall remain in full force and effect for so long as it is posted on any of Our websites. You agree that We may at any time and for any reason, terminate Your access to Our website and its services, or restrict or suspend Your access to all or any part of the Website, premises, space or coworking or services at any time, for any or no reason, with or without prior notice, and without liability. We may also terminate the rendering of any service including use of premises without prior notice or liability. If You fail to comply with Your obligations as per the terms and conditions of Use and if You violate any of the ethical practices and terms and conditions of use. Innov8 or its affiliate as the case maybe, acting reasonably, is no longer able to provide You with access to the Premises. Upon such termination, You are required to immediately return all property including all material, computers, data, keys etc., that may have been handed over to You and that belongs to Us; remove Your property from the Premises; vacate the Premises in a respectful manner; leave Your area of the Premises in a clean state. You are required to remove all your equipment, belongings, articles and things and its employees / personnel and to vacate and hand back the premises and at the same time hand over all keys and access cards. You shall remove from the premises your equipment provided that any damage or defacement is occasioned to any part of the Premises in the course of such removal, the same shall be remedied by you immediately and at your own expense. If you fails to do so, Innov8 may do so at yours expense. Any material and property that may belong to You and that may have been left behind, We reserve the right and liberty to dispose it off in the manner We deem fit after a period of 30 days from the date of such termination. We may also require You to follow additional rules, guidelines or other conditions in order to participate in certain promotions or activities available through our website or otherwise. These additional terms are part of these Terms, and You agree to comply with them when You participate in those promotions, or otherwise engage in activities governed by such additional terms. We reserve the right at any time to modify, edit, delete, suspend or discontinue, temporarily or permanently the Service or website (or any portion thereof) with or without notice. You agree that We will not be liable to you or to any third party for any such modification, editing, deletion, suspension or discontinuance of our Platforms. The failure of Innov8 to exercise or enforce any right or provision of these terms and conditions shall not constitute a waiver of such right or provision. If any provision of these terms and conditions is found by a court of competent jurisdiction to be invalid, the parties nevertheless agree that the Court should endeavour to give effect to the parties’ intentions as reflected in the provision, and the other provisions of these Terms remain in full force and effect. These Terms are governed by the laws of India. Any disputes/ matters arising under these terms shall be subject to the exclusive jurisdiction of courts located in New Delhi and will be resolved by arbitration in accordance with the Arbitration and Conciliation Act, 1996. Those who access or use our website from other jurisdictions do so at their own violation and are responsible for compliance with the local law. Guerrilla Infra Solutions Pvt Ltd.